As we draw closer to the NHL’s trade deadline, the Edmonton Oilers aren’t taking hold of a playoff spot nor are they falling completely out of the race. Therefore, one question has to be asked — should they go all-in or should they keep their powder dry at the deadline? Oilers general manager Peter Chiarelli has the unenviable task of finding a way to upgrade his roster without bleeding it dry of its most vital blue chip prospects. Players like Jesse Puljujarvi, Kailer Yamamoto and Ethan Bear are among those I imagine being coveted by rival GMs in an attempt to take advantage of Chiarelli’s self-imposed conundrum. Edmonton’s draft picks are also likely to be preyed upon given the team’s precarious place in the standings. The pressure to make the playoffs was indisputable when game three of the season was declared a “must-win.” The tension of that burden was then magnified infinitely when Todd McLellan was fired and Ken Hitchcock was brought in. The Oilers could’ve gone with an internal option as head coach for the rest of the season as Glen Gulutzan and Trent Yawney both held such positions in the past. Instead, management brought in a coaching legend to see the rest of the season out and to let the fanbase know that it’s playoffs or bust. The problem with this scenario is that it is eerily similar to when Chiarelli was hired by the Oilers in the spring of 2015. They’re behind the 8-ball and will need to pay significantly to get out from behind it. At Chiarelli’s first draft in June 2015, he paid dearly for defender Griffin Reinhart with a first and second-round pick. 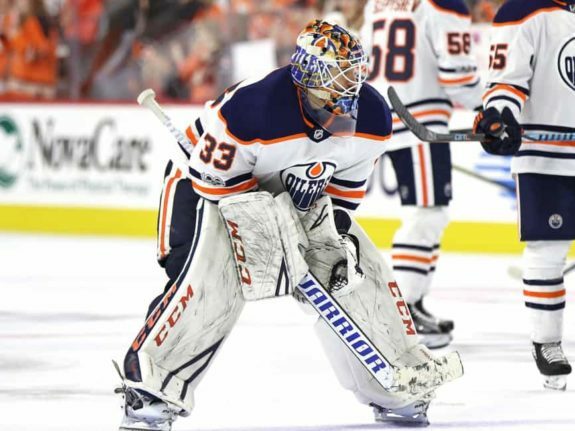 He also gave up a second, third, and seventh-round pick to the New York Rangers for goaltender Cam Talbot and a Rangers seventh-round pick. Right there, the onus was on immediate improvement. After missing the playoffs in his first year in charge, he dealt Taylor Hall to the New Jersey Devils for Adam Larsson. The Oilers actually made the playoffs after dealing Hall, but the Oilers weren’t done dealing. After the 2016-17 season, they moved winger Jordan Eberle, who went goalless in said playoffs, to the New York Islanders for underachieving center Ryan Strome. Some might say the Oilers are no better for all of those moves, and they may or may not be right depending on how you feel about the impact injuries have on a roster. The point I’m trying to make is that they were under massive scrutiny to improve the roster in a timely manner and, in my opinion, it was a foolish game plan that has failed. Chiarelli and his team without a doubt could try to bring in the likes of Wayne Simmonds, Dougie Hamilton and Michael Ferland if they saw fit. The problem is there’s a salary cap and consequently, they’d most likely be looking at struggling players on expiring contracts like Ryan Dzingel, Mats Zuccarello and Michael Del Zotto instead. No disrespect to those players, but they’re not exactly in the same tranche as the first three. That being said, Dzingel, Zuccarello and Del Zotto would bring quality to the roster and give the team the option to keep their young blue chippers in the AHL. One of the great things that the Oilers have done under Chiarelli is rebuild their prospect pipeline. Just this season, we’re seeing the fruits of that labor in the performances of young defender Caleb Jones. Edmonton doesn’t have a playmaking defender like him on the team with Oscar Klefbom on injured reserve. Jones’ offensive instincts have proven a very comfortable fit with the team thus far. But it’s not just Jones I’m talking about. Tyler Benson is a top scorer in his rookie season with the AHL’s Bakersfield Condors. 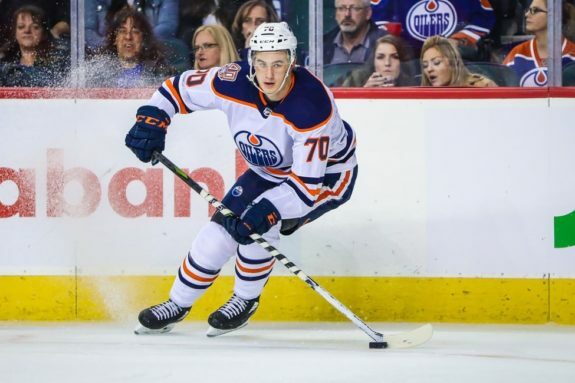 Kailer Yamamoto, a recent call-up, is driving defenses nuts in the AHL with his quickness and high hockey IQ. Goalies Dylan Wells, Shane Starrett and Stuart Skinner are all having fine seasons in the minors as well. If we jump to the junior ranks, Dmitri Samorukov was a stud for Team Russia at the 2019 World Junior Championships. Phil Kemp also starred for Team USA, as well as Evan Bouchard for Team Canada. Kirill Maksimov is scoring at will for the Niagara Ice Dogs of the Ontario Hockey League and Ryan McLeod was just added to the Saginaw Spirit in a massive deadline deal to increase their chances at winning the OHL championship. Powered by an unwavering engine while endlessly dynamic at both ends of the ice, Krebs could become one of the NHL’s best and most consistent two-way centres in the near future. Bottom-pair defenders like Kevin Gravel, Brandon Manning, Alex Petrovic and Matt Benning are always traded at the deadline to teams looking for depth. Blue collar, two-way forwards including Tobias Rieder, Zack Kassian, Alex Chiasson and Jujhar Khaira would certainly be crave as well. They could very well relieve themselves of some salary cap pressure as well as pile up draft picks and prospects in order to hit the reset button on a failed rebuild. With the team being so close to a playoff spot despite the injuries they’ve incurred, would it be a responsible plan to trade off the hard work performed by the team’s amateur scouting staff for a quick fix? This team has shooting wingers, offensive defenders, smooth skating two-way defensemen and high-octane centers on their way. It’d be a travesty to give that up. There’s no guarantee that any moves made by the management staff in Edmonton will result in a postseason birth. The team is only two points out of the final wildcard spot as it is. If they can tread water until Klefbom returns, get some scoring from lower in the lineup and some solid goaltending, I say take the risk. Then correct this summer without expending any more assets. You can’t build a long-term future with short-term thinking.